In release 4.2 we changed the workflow surrounding multi year packages and master lists in response to feedback and to save time. Instead of adding a new master list each year to the knowledgebase we will maintain one master list per publisher in perpetuity or till the publisher ceases. The ‘master’ list provides titles from a specific publisher and is useful for when adding individual subscriptions. Current master lists do not include a year in their title like the old master lists, for example Organisation for Economic Co-operation & Development:Master is the current list while Organisation for Economic Co-operation & Development:Master:2013 is the old master list. If you have a subscription linked to a master list we advise you use the current master list, the one without a year in the title, as this regularly updated. The team are currently working on updating KB+ with data for 2015, we hope will help to save time during your renewal process by providing information on any additions/deflections made to a title list in conjunction with your journal usage statistics. 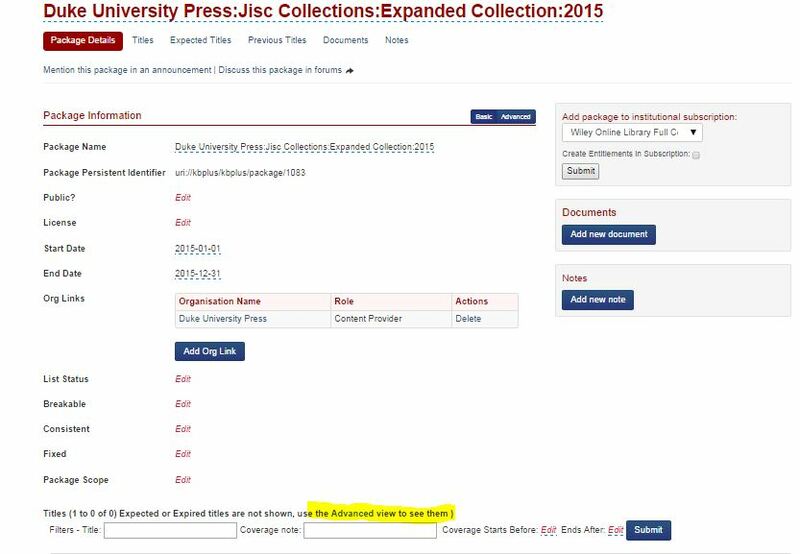 Q: What do I do if I am not able to find a 2015 collection title list? Walter De Gruyter:Master, as we are updating the information on titles joining (expected titles) and leaving publishers (previous titles). You can also sign up to the KB+ list forum to be advised when lists have been added and any modifications can be seen in the To Do list. Q:What do I need to do for annual subscriptions if the 2015 list is available in KB+? 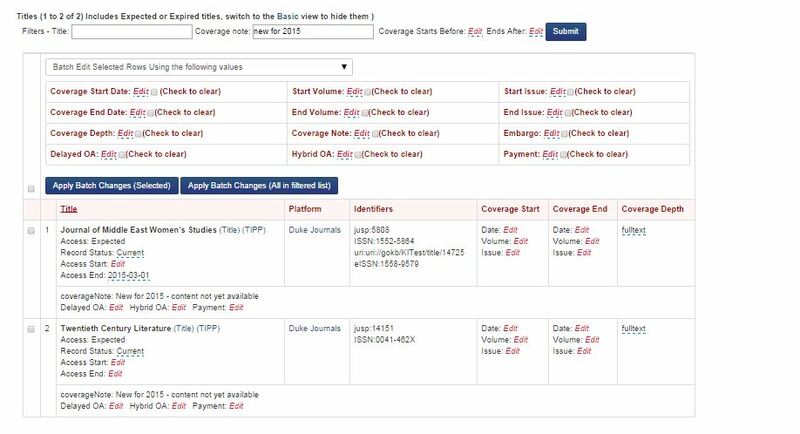 For annual subscriptions you can use our renewal process and use the comparison basket to compare your current subscription with the title list for the following year this will result in a spreadsheet with your JR1 stats and an indication of which titles are in the new list but not in the old and vice versa. You can then reimport this spreadsheet to create your new subscription for 2015. Q:What do I need to do for multi-year subscriptions? If you have subscriptions for multi year deals you can simply view the expected & previous titles from the subscription screen, we update this information once we have been notified. Q:How do I view the titles for a 2015 title list? To see which titles are in a 2015 titles list select ‘Expected titles’, please note there is currently a problem with using scrolling through to the next page, you can however export a full title list from our export page. Q: How can I view what titles have left or joined a package from a 2015 title list? You can filter this title list for “New for 2015” and “transfer in” to see what new titles are to join the package or filter the list by end date (2014/12/31) to see which titles are leaving. Once you have typed the filter or selected the date and clicked submit, you will need to click ‘advanced view’ again to see the results. From the start of 2015 onwards you will be able to use the previous and expected views, only titles expected after 01/01/2015 will appear in the expected list. Q. Can I export this list? Yes, once on your subscription page you can export any list in a variety of formats including one for use in your link resolver. Alternatively, you can download in an excel format from our exports page or check the Jisc Catalogue for a link to the verified title list. Q: How can I sign up to the KB+ list forum? Please see our user guide.